- Durable alloy material, not easy to fade and deform. - Multi layer necklaces is comfortable and stylish to wear, great with your many kinds of outfits. - Perfect for your family, friends and lovers as a gift to show your special love to them. - Please allow us 1-2cm error on size because it is measured by hand. 2. Avoid contact with high temperatures and acid, alkali solution. 3. It can be easily removed when bathing or swimming. 4. It is recommended to use a piece of match stick volumes wadding scrub pendants. SuYi, As a famous jewelry brand. Writing history with innovative ideas and elegant design, Purest tradition of manufacturing and elegant cultural heritage, SuYi became a symbol of the art of fashion accessories. As a shining star of jewelry brand, SuYi are committed to create freedom, elegant, distinctive style for you. Providing customers with the most meticulous service, many carefully built rings, necklace and earrings, representing SuYi commitment to be excellent jewelry brand. Material: The layered necklace is made by alloy material. 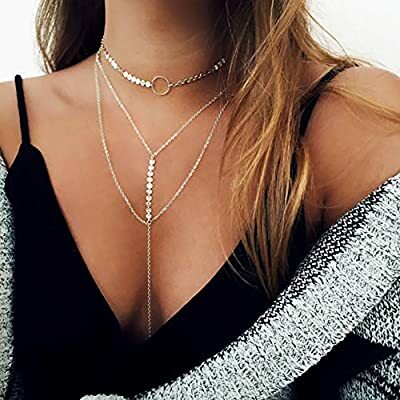 Kindly note: The dainty necklace may be easy to tangle due to the multi-layered design, and we suggest taking it from the clasp, which would be better. Absolutely amazing style! Comfortable and beautiful! Exquisite style with shining sequins makes the layering necklace a charming decor for you in many occasions like evening party, important ceremony and friends' gathering. Closed with a firm lobster clasp, and the length of the sequins necklace can be adjusted appropriately with the extended chain to meet your need. Come with a Suyi velvet box.